We believe that this philosophy leads to meaningful engagement with our communities, our customers and our retailers (our Customers). And what better way to connect with you, our Customer, than to understand how you have arrived here and what you are all about. We want to talk with you about Melvin and invite you to join us in an exceptional beer experience, whether that is a core beer with us, Melvin Presents party, a new barrel aged release, or the newest member of our RIIPA series. …And sometimes, we are going to invite you to help do amazing work in your community, like through our RIP Medical Debt program: drink a Your IPA and save your neighbor from crippling medical debt. We’ll continue to develop more ways to strengthen our communities and our bonds with our friends. *You can find our full account and statement of the incident in Bellingham here and a note from the Bellingham Brewpub Operations Manager here. T-Shirt Gatling Guns; Wu-Tang played by the brass band on a flatbed parade; Cirque du Melvin Party thrown by your Melvin Ambassador. We are bringing the Melvin madness to a bar or brewpub near you. 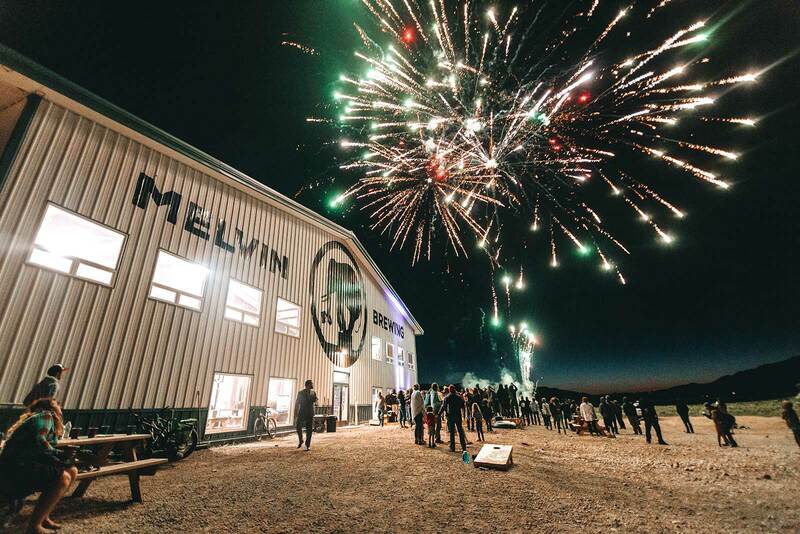 Through major Melvin Experiences and day-to-day events, Melvin creates exceptional beer experiences for its friends. We believe that when we engage through music, beer, and fun in a safe environment, we will create lasting impressions for our current and potential Customers. Our big beers and our big experiences aren’t for everyone, but we want people to know us through the experiences that we celebrate with them. Good relationships arise from positive shared experiences. Melvin’s people proactively work with local organizers to create events that support community goals and create exceptional beer experiences. From charitable events and charitable giving to brewery collaborations and shared brewery resources, we search for opportunities to deepen our relationships in the communities where we have chosen to sell beer. We value the unique experience that each community shares as we become a part of it. Help us become a bigger part of your community: Send us a message at info@melvinbrewing.com. Melvin got started because the West Coast Style IPA did not exist on Wyoming’s “West Coast”. Desire for great beer drove our founder to meld new thoughts in marketing with new thoughts in beer development. Today, innovation remains the core of our craft. We believe that through hard work and dedication, each team member will drive breakthroughs and innovation: whether developing a new world-class beer recipe, improving efficiency or quality to the next level through brewing process, or making the improbable marketing and events possible. Melvin is committed to trying new ideas and creating exceptional beer experiences in our communities. We strive to bring our team together to realize and evolve our vision. Fun is our core, beer is our business platform. You don’t start a brewery in Wyoming by accident. Our founder chased his dreams of snowboarding the biggest mountains and biking the gnarliest trails to Jackson Hole. Melvin continues his vision of brewing exceptional beer in the mountains by hiring production staff who select the outdoor lifestyle provided by the Wyoming wilderness and encourage them to own and love the mountains. Across our team, we are fortunate to be able to partner with teammates who represent our culture and company, enjoying what Melvin does and how Melvin does it. Many of the events, groups, and charities that we sponsor in our communities foster health and our relationship with the outdoors. We love to see our people and our Customers choose to embrace an active lifestyle, challenge themselves, achieve greatness, and finish the day with a Melvin.